Obviously, the chocolate ones are my favorites, but I also would love to indulge on a blueberry protein donut, or maybe a greek yogurt cheesecake. No matter your preference, I’m sure you can find at least something that fits what you’re looking for. Enjoy – guilt free! 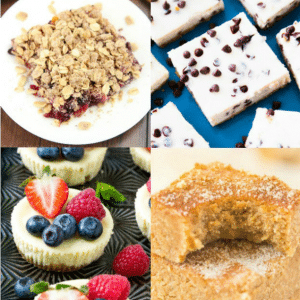 Which dessert do YOU want to try most? It’s no secret whatsoever that I absolutely LOVE chocolate – and one thing it goes perfectly with is caramel. 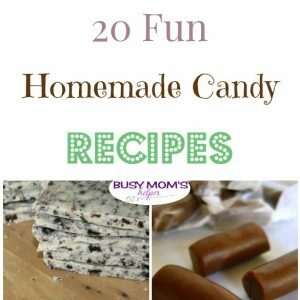 I thought it’d be perfect to share a delicious list of 20 Chocolate and Caramel Recipes so you have plenty of options for a tasty snack or amazing dessert! There’s everything from cupcakes, popcorn, drinks, cakes, cookies and so much more – maybe you’ll choose the caramel fudge pops. I’m drooling over the brownies, myself. 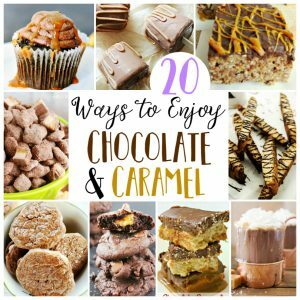 Whatever you choose, I hope you love these chocolate and caramel recipes as much as I do! I’m always unsure of how to decorate my kitchen. I don’t want it too cluttered, and prefer to keep the feel of ‘kitchen’ versus a random storage area. One thing I’ve noticed many people do is use cookbooks – then it’s not only fitting decor, but also useful! 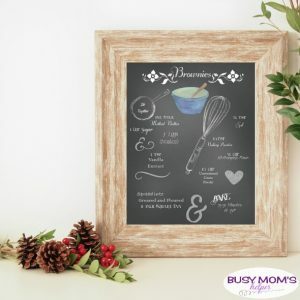 You can also use this fun Printable Brownie Recipe Decor for a beautiful framed piece, or use it when you whip up these tasty brownies for a pot luck party. How do YOU like to decorate your kitchen? Everyone knows how much I love Dr Pepper®, and any excuse to use it in a recipe, party plan or just because – so when I heard about their new limited edition “Pick Your Pepper” designs, I couldn’t wait! There’s so many fun, unique designs to choose from, so you can have a fantastic gathering in just about any theme. 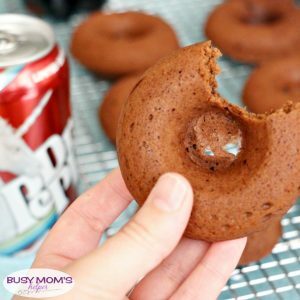 One treat that’s especially great to have during these hot months are donuts – and these Dr Pepper Donuts are perfect for a summer party! First of all, swing by Kroger or a Kroger banner store to nab some of these awesome Dr Pepper designs, and be sure to take advantage of Kroger’s offer (Buy any 3 Dr Pepper 12pk or 8pk 12oz (any variety), get a free 20oz). This great offer is available 6/21-8/15 or while supplies last. Check your local Kroger for specifics! The fun new Pick Your Pepper packaging was super popular at my location, and the soda guy restocking the shelves said he was having quite the time keeping them in-stock! I was able to grab 12-packs with a Unicorn design, as well as some 20oz bottles with various designs like unicorns (they seem to be REALLY popular lately! ), wolves, golf and even a fun retro-kitchen type design. There’s something for everyone, such as those that like sharks, doodles, dancing, mustaches, 80’s, retro, gaming, comics, plaid, beaches, hearts, paw prints, music, sports, flowers and SO MUCH MORE! I had a hard time choosing – luckily Dr Pepper has always been my drink of choice, so I have no problem stocking up my shelves with my favorite drink so I can select more of these LIMITED EDITION styles. Now on to our delicious summer party recipe – Dr Pepper Donuts! This batch makes roughly 12 donuts, so adjust as needed. They’re really quick to whip up, and are a definite crowd-pleaser. Grease or spray your donut pans really well, set aside. Do NOT preheat the oven yet! Cream the butter, sugar, eggs and vanilla until creamy. Add in the flour, cocoa powder, baking powder, and salt until well-combined. Add the vegetable oil and Dr Pepper and mix until smooth. Let sit while you NOW PREHEAT THE OVEN to 325 Degrees F.
Once the oven is ready, scoop or pour the batter into the prepared donut pans, filling each about 2/3 the way full. Bake 8-10 minutes, or until a toothpick inserted comes out clean. Cool slightly before serving. Enjoy! One reason I enjoy baking with Dr Pepper is that it’s easy to enjoy a sip (or two or three or…) while baking! For you Snapchat fans, don’t miss out on a cool filter using the Snap code on the limited edition Dr Pepper 20oz bottles. I’m eager to see everyone try it out! Nab your Limited Edition Dr Pepper Pick Your Pepper designs at Kroger while they last! I’m a big fan of churro recipes – they’re so tasty and refreshing, plus they always remind me of Disney vacations in the past! When we visit Disney with everyone, my dad almost always has a churro in-hand no matter where we are in the park (except some rides, of course)! 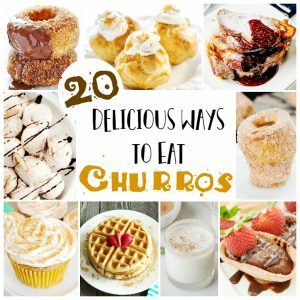 Most people think of the crispy churro sticks for this popular treat, but there’s so many more ways to enjoy them – like these 20 Delicious Churro Recipes! There’s everything from churro cupcakes, waffles, doughnuts, pies, and popcorn – or maybe you’d prefer churro ice cream, french toast casseroele, cream puffs or muddy buddies! Whatever you choose, you’re bound to love these amazing churro recipes! It’s in the 90s outside right now, so even if I’m craving a delicious hot chocolate, it just wouldn’t be as enjoyable in this heat. Luckily, I can still have that delicious taste of chocolate and marshmallow with these amazing Hot Cocoa Cookies! They’re soft and full of chocolate-y flavor, plus the ‘mallows on top add just the right hint of balance to make it an edible version of a favorite drink. My kiddos are in love with this hot cocoa cookies, too, and can’t wait for me to whip up another batch. I love that it’s a super EASY recipe, and easy to complete from start to finish in less than 30 minutes. YAY for simplicity! 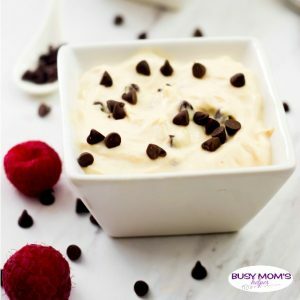 Melt the butter and chocolate chips in a saucepan over medium heat – set aside to cool a bit. Preheat oven to 325 Degrees F. Spray or line two baking sheets, set aside. Cream the brown sugar, eggs and vanilla until smooth. Add in the salt, cocoa powder, flour and baking powder. Pour in the slightly-cooled melted chocolate and mix until well-combined. Make the cookie balls, roughly 1″-1 1/2″ in size. Place on cookie sheet, leaving enough room between each cookie ball so they can spread a bit. Bake about 10 minutes, or until cookies start to ‘crack’. Remove, top each cookie with half a large marshmallow or 5-6 mini marshmallows. Place back in oven and cook another 3-4 minutes, or until marshmallows start to brown. Allow to cool a bit before serving. 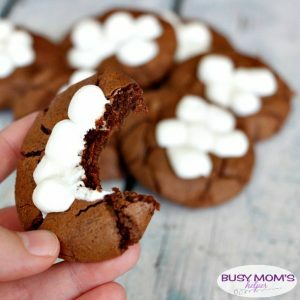 I love that these cookies are soft and full of chocolate goodness, plus the gooey marshmallows on top complete this treat. 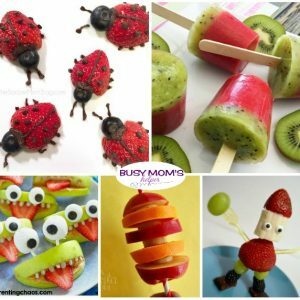 You can whip them up for dessert or snack any time of year – even if it’s 90 degrees outside! I had no idea what Nutella was growing up, but everyone seemed to love it. When I finally tried it for myself as an adult, I could tell what all the hype was about – it’s so delish! 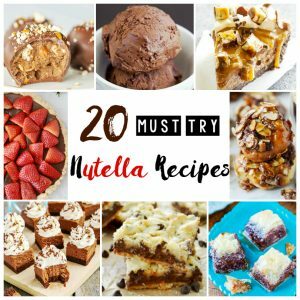 I thought it’d be fun to share a list of 20 Must Try Nutella Recipes – everything from pies and ice cream, to snack bites, bars and more. If you’re a Nutella-lover, you can’t miss these incredible desserts and snacks! 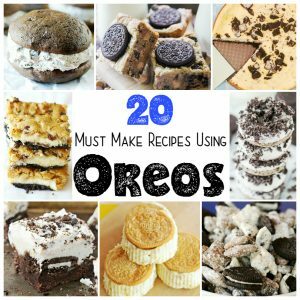 You all know how much I love chocolate, but that doesn’t mean I can;t enjoy other flavors or types of dessert recipes, too. I love mixing it up sometimes with yummy ideas like this Orange Sponge Pudding. It’s so smooth and refreshing, you may find yourself not wanting to share! Isn’t it pretty, too? This would be the perfect little dessert for a party or special gathering. 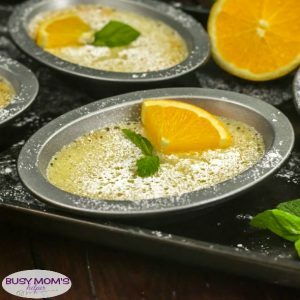 With a little orange wedge and mint leaf on top, it looks elegant enough for any occasion! I love puddings, because they’re so smooth and full of flavor, and this is no exception to that! Every bite is a fresh, but not overwhelming, citrus taste to enjoy. Preheat oven to 325°F. Separate the eggs. Combine the milk and butter in a saucepan and heat over medium heat, till the butter is melted and the milk is scalding but not boiling. Remove from heat and let it cool for just couple of minutes. Place egg yolks in a bowl. Add sugar. Whisk the eggs and the sugar for a minute till creamy. Gradually add the hot milk, whisking continuously, till the sugar is dissolved. Add the zest and juice of one large Navel orange. Whisk it well. Now add the all-purpose flour along with a pinch of salt. Whisk it well and ensure a lump free batter. Keep aside. In a separate bowl, whip egg whites with an electric mixer until stiff. Gently fold in the whipped egg whites into the prepared batter. Divide the batter equally between 6 custard bowls or ramekins. Arrange bowls in a baking or roasting pan. Add hot water to come halfway up sides of cups. Bake puddings for 15 minutes, or until tops are golden, about 15 minutes. Let custard bowls sit in the water for 10 more minutes. Finish cooling on a wire rack. Serve chilled or at room temperature with a light dusting of powdered sugar (optional). Since hubby loves chocolate oranges so much, I’m considering trying these with a light drizzle of chocolate frosting – that sounds almost too good to be true, though! Whether you try it a little different or as-is, you’ll love this drool-worthy sponge pudding. Now, what flavor should we try next? Maybe a nice lime sponge pudding – or I’d love to give a chocolate mint sponge pudding a try!